121106 Happy 7th Anniversary Super Junior! November 6, 2005– the birth of the new stars. 7 Years of Laughter and Tears. 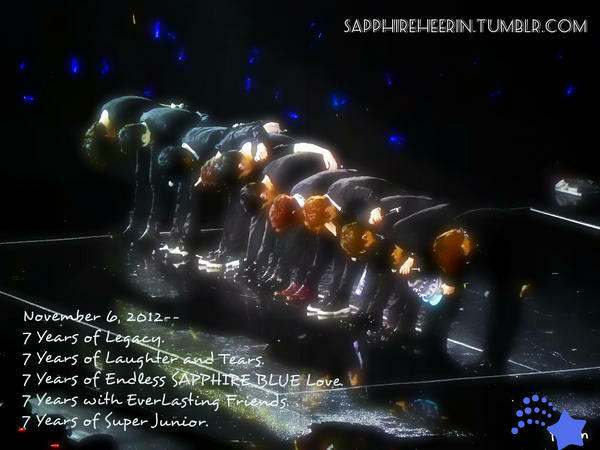 7 Years of Endless SAPPHIRE BLUE Love. 7 Years with EverLasting Friends. 7 Years of Super Junior. Super Junior‘s Sungmin showed off his skills in the kitchen recently on the ‘Chef King’ special of ‘Come to Play‘. On the May 28th broadcast of MBC’s ‘Come to Play’, Sungmin surprised everyone on set as he prepared a meal that had everyone’s mouth watering. Other teams that took part in this episode were Lee Hyun Woo – Ryeowook and Kwon Oh Joong – Changmin. Super Junior’s Kyuhyun recently revealed that he signed an affidavit of support for his father’s business, making him the ideal son. On the episode of “Radio Star” that aired on March 7, Kyuhyun was listing all of the things he did for his parents with his income. Beforehand, the members of 2AM were showing off what they did for their parents. 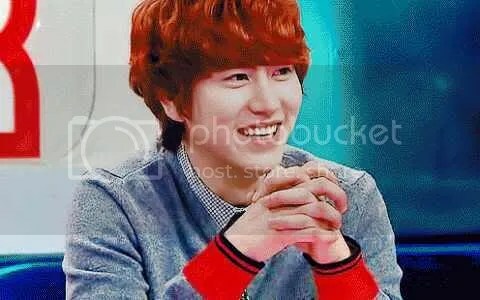 So because Kyuhyun didn’t want to lose, he revealed that he signed an affidavit of support for his father’s business, which drew many eyes. This episode of “Radio Star” was a 2AM come back special. It featured the members of 2AM, Jo Kwon, Changmin, Seulong and Jinwoon, who all have both the looks and the skills. They also showed off their exceptional variety program skills as well. 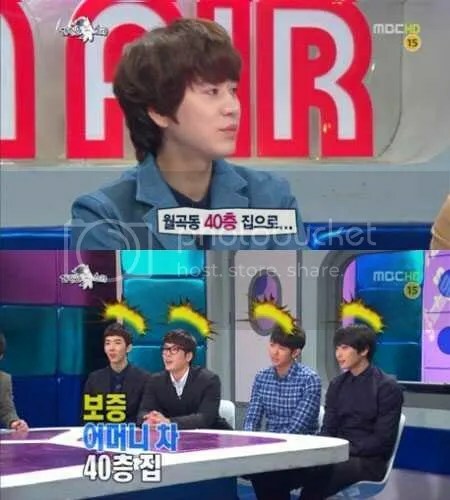 Kyuhyun continued, “I’m driving the car my mother used to drive and I gifted her with a new one. My father started an academy in Taiwan and I signed the affidavit of support,” to everyone’s surprise. It’s nice to see our K-Pop idols be good sons/daughters to their parents! Siwon: Ah, hello everybody, I am Choi Siwon. HeeDJ: Ah~It’s our sculpture-like pretty guy Choi Siwon. HeeDJ: So you have many more other nicknames~Choi Siwon-ssi, what exactly did you call me when you rang me up just now? HeeDJ: You called me your “dear”. Siwon: Yes, it was in Singapore. HeeDJ: You saved the fans in Singapore~! Siwon: Was it in Singapore? HeeDJ: Wasn’t it in Singapore when you stopped the barrier from toppling over? HeeDJ: Ah……It was in Seoul~? HeeDJ: Choi Siwon-ssi, who knows, one day I might just get married. HeeDJ: Kim Heechul~! Your hyung Kim Heechul~! Your DEAR~! HeeDJ: If I get married, you will congratulate me, won’t you? Super Jr. unknowingly! Or maybe I should say finally? I love you and thank you~ We are really happy. The Hallyu wave is taking the world by storm, and the South Korean officials have estimated that there are a total of 3.3 million Hallyu wave fans around the world. The most well-received singer is none other than Super Junior, who even beat the Hallyu prince Jang Geunsuk, coming out on top as the most favoured Hallyu stars amongst overseas netizens. The South Korean English-language website Korea.com had recently held a poll to find out who is the most popular Hallyu star internationally, attracting close to 10,000 netizens for the polls. Super Junior, who enjoyed an explosive popularity throughout Asia with their song “SORRY, SORRY”, even holding concerts in Europe and America with their other labelmates, won over Jang Geunsuk in the poll with 3063 votes against Jang Geunsuk’s 2303, while SHINee, Lee Minho and Girls’ Generation took 3rd to 5th spots respectively. The South Korean Ministry of Culture and Tourism announced the total number of Hallyu fans around the world yesterday by taking into consideration the number of fans in the overseas fanclubs, and they have estimated that there are about 3.3 million people (who are fans of the Hallyu wave). Amongst them, China, Japan, Vietnam and various other Asian countries have the largest fanbases, accounting for 2.31 million people. They have also revealed that fans of singers took the largest percentage, showing the power of the K-POP culture. Aside from that, Super Junior will be going against their labelmates Dong Bang Shin Ki, Big Bang, 2PM, and BEAST in the Best Male Group category of the M.net Asian Music Awards (MAMA), which would be held in Singapore on the 29th of November. Please do not modify or remove any part of the credits when taking out. Super Junior member Eunhyuk has revealed that he comes in last in terms of appearance in the group. On the special episode of the MBC TV variety programme “Come to Play”, which was aired on the 31st (of October), Eunhyuk, Donghae, Lee Junghyun, and Jang Sohee were the guests on the show. On the day’s episode, Eunhyuk expressed that “When I watched how the members on MBC TV’s Infinite Challenge ranked themselves in terms of their appearance, I thought about how we have one such ranking in Super Junior as well”, and this comment of his piqued the curiosity of the audience. Eunhyuk said that “The most handsome member is Siwon, while Donghae and Heechul are ranked among the top few. On the other hand, I’m ranked at the end of the list”, telling about his awkward appearance rankings. This has dealt a blow to Eunhyuk, (whom further added that) “I have always thought that Shindong, Yesung and Ryeowook were behind me (in the rankings), but it wasn’t so. Even Shindong was placed in the middle”. When he remembered how Shindong stood out after receiving a double-eyelid surgery recently, Eunhyuk humoredly commented that “I’m fretting whether I should receive some help from the expertise of modern medicine like Shindong as well”, causing everyone to double over in laughter. After hearing Eunhyuk’s comments, Donghae amended that: “This is a ranking which does not take into account charms or personalities, one which is purely based on appearances”. Although he wanted to help Eunhyuk out, but the hosts said “Why does this make others feel even more sad (for Eunhyuk) after hearing it?” instead, earning laughter from the audiences. Aside from that, on that day’s “Come to Play”, Eunhyuk had also talked about his pact with JYJ’s member Kim Junsu to never smoke nor drink alcohol, earning everyone’s curiosity. Super Junior’s Donghae and famous Chinese actress Zhang Ziyi danced to “Sorry, Sorry” together? On the MBCTV variety programme “Come to Play” which was broadcasted on the 31st (of October), Donghae revealed that “Zhang Ziyi and I…” in one of the segments, but even before he could finish his sentence, hosts Yoo Jaesuk and Kim Wonhee were already extremely curious (about what he had to say). A surprised Yoo Jaesuk asked that “Are you talking about the world star Zhang Ziyi?” and Donghae answered that “I didn’t know that she was such a famous celebrity, and we even danced to ‘Sorry, Sorry’ together”, causing Yoo Jaesuk to be astonished. Eunhyuk, who guested on the show together(with Donghae), made a comparison to Jang Sohee’s previous story where she had tea with the Prime Minister of Mongolia, saying that “later on it’s not only tea, but (you) ended up dancing as well right~”. His hilarious explanation caused the venue to be submerged in laughter. Netizens who have watched the show left diverse comments such as “How well can Zhang Ziyi dance to ‘Sorry, Sorry’, I’m curious~”, “As expected of the Hallyu star who is at the level of a national treasure~ Even dancing with Zhang Ziyi~”, and “The Hallyu stars’ contacts are really amazing” and more. The day’s guests included actress Jang Sohee, Lee Junghyun, and Super Junior’s Eunhyuk and Donghae. Please do not remove or modify any parts of the credits when taking out.